One night in the 1980s, Charles Hull invented the world’s first 3D Printer using the method of Stereolithography (SLA). Hull was, however, aware that it would take around 30 years before such a technology is widely adopted. Well, he was absolutely right! 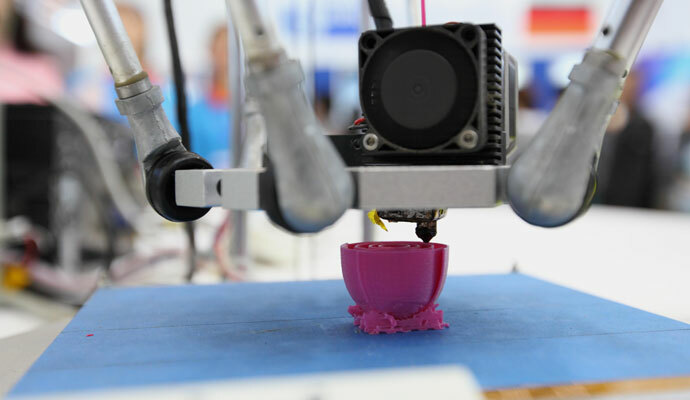 Despite being patented in 1986, 3D printing was only popularised in the 2010s. 3D Printing is a computerised process of creating a three-dimensional object by forming successive layers of materials. Numerous manuals on operating 3D printers are circulating on the internet, and the process is being simplified over time as Microsoft and Google have started enabling 3D scanning through their hardware. Smartphone companies are also developing technologies to integrate 3D scanners in future versions of their products. As of now, the process generally consists of feeding the sliced version of a 3D model (divided into thousands of layers using software) into a 3D Printer via a USB flash drive or Wifi. The printer then analyses every slice as a 2D image before replicating the 3D object. Author Supercharg3dPosted on 6th October 2016 6th February 2017 Categories Paradigm Shift, Supply Chain Impact, Supply Chain Models, Wider ImplicationsTags Paradigm, Supply ChainLeave a comment on What does the rise of 3D printing mean for global companies? A couple of trips away from the office in recent weeks have served to reiterate to me the position of the 3D printing and additive manufacturing industry within a much broader context. It’s always a good thing when this happens I find, as it gives me a much wider perspective — both personally and in the way that I approach my work. Sometimes I am guilty of focusing too closely on the minutiae and forget to take a breath and look at the bigger picture within a much larger framework. Thus I am grateful when opportunities arise that allow me to take stock. And so even as 2016 heads towards its close, the bigger picture I speak of is worth considering from a couple of angles. When I attended IMTS recently, I was wholly struck by the vast size of this trade show; four buildings at McCormick Place were filled, some on multiple levels, with swathes of companies (2,407 of them) offering every conceivable manufacturing product and service. It was immense! The Additive Manufacturing Pavilion was dwarfed by comparison, and did not cover even 1% of the floor space. It was by no means insignificant, and it drew considerable interest and visitor numbers, but it drew a poignant analogy. Moreover, even while appreciating where additive technology currently fits within the spectrum of manufacturing technology in terms of size and revenues ($5 billion versus multi-trillion) the considerable optimism for its current application and future potential is equally real.